I was always taught to have measurable goals. A couple of years ago, I began running longer distances. It began as a whisper in the back of my head… maybe I should train for a full marathon? But if I run a full marathon, I need a tangible goal. I better get serious about it and try to qualify for the Boston Marathon. So my quest began. I blogged about my history of running and my first marathon. 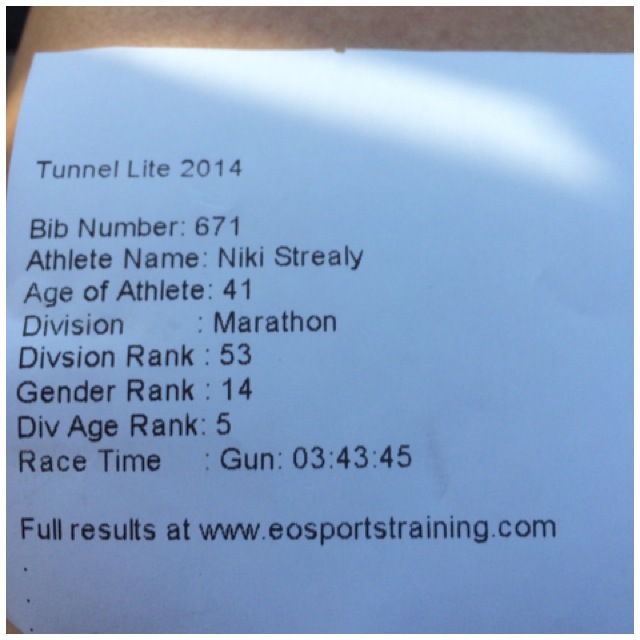 Since I had just turned 40, my Boston qualifying time was 3hrs and 45 minutes (3:45:00). 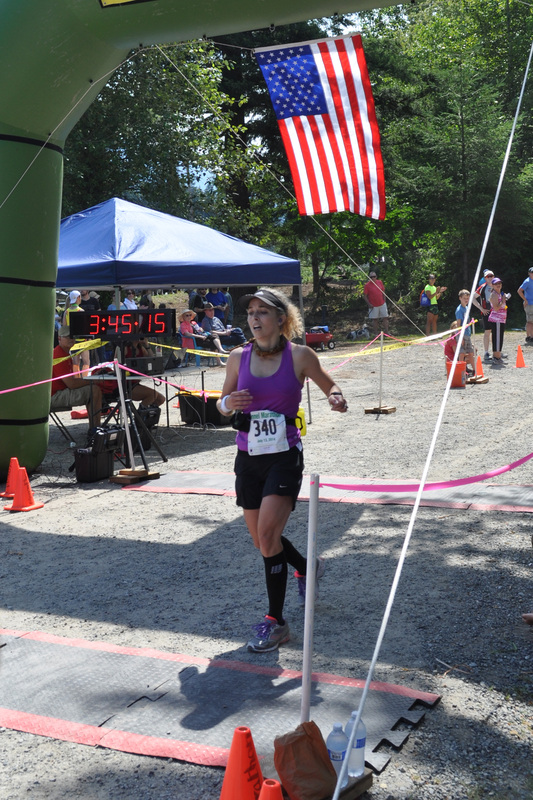 At the Eugene Marathon, my finish time was 3:46:01. I thought, I can shave a minute and a second off my time, no problem! 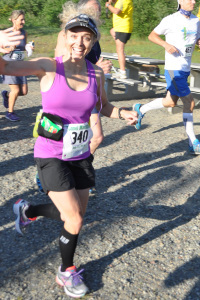 Later that year, I trained harder (still using Runner’s World’s Run Less Run Faster program) for the Portland (Oregon) Marathon in October 2013. The good news, again I was able to run a whole marathon without any diarrhea, but bad news, I started getting nauseated at mile 19 and it slowed me down the rest of the race. My finish time? 3:45:17. Yes, I missed my cutoff time by a mere 17 seconds! I have never been one to give up. 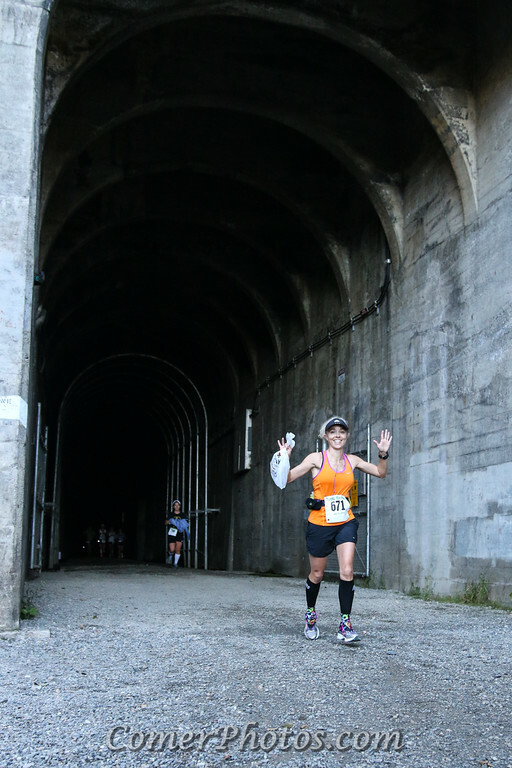 So earlier this year, I signed up for a downhill, but Boston-qualifying marathon called Light at the End of the Tunnel Marathon on July 13, 2014. I trained in earnest, getting my workouts in while keeping **BOSTON MARATHON** in the forefront of my mind. As I had done with previous marathons, I spent the week prior to the marathon eating very conservatively… only foods and quantities my gut would tolerate. I ate quite a bit of chicken, some dairy, eggs, a fair amount of bread (gluten and I are still friends), and actually very few veggies. As a result, my GI tract was quiet all week heading into the race. I also made sure I was well hydrated. For dinner the night before the race, I ate the typical pre-race pasta meal (fettuccine alfredo with chicken). That evening before bed, I took my dose of Imodium and and a Prilosec (proton pump inhibitor). Since I had experienced nausea the first two marathons about mile 19, I was curious to see if it was related to the acid in my stomach somehow. That night I had to get up and pee twice during the night, so I knew I was plenty hydrated! On race morning I was so nervous I could only eat some dry Life cereal. I was able to have a normalish BM and popped two more Imodium (for some of you that may be TMI). The day was gorgeous, but forecast for 91 degrees for a high temperature. It was already 63 degrees at the start! 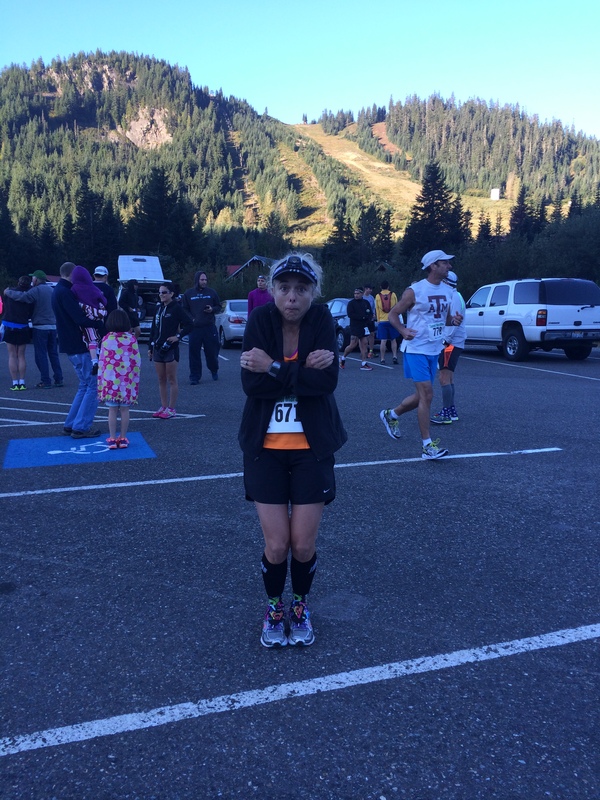 I headed to the porta potty first (no diarrhea–yay!). As I waited in line to pick up my bib number, I powered through 1.5 scoops of UCAN. 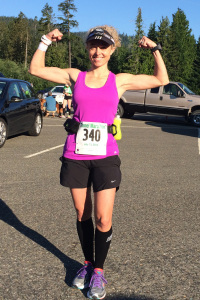 I haven’t discussed UCAN yet on my website, but it is my new FAVORITE running fuel. I will spend an entire blog post on it in the future, but you can read more and check it out here. This course is beautiful. It’s about 30 miles east of Seattle up in the mountains near Snoqualmie Ski Resort. The marathon is billed as an “all downhill course”, but there are are few uphill sections. The course itself is a gravel road; you run in the ruts ( no cars, only bikes and people walking/running). The scenery is breathtaking, and you cross four or five suspension bridges. The downside, there are no porta potties on the course, and only a few outhouses along the way. Waving goodbye to my family at the start of the race. Notice my Sport Beans are about to fall out of my fuel belt? The race gun sounded, and I waved a final goodbye to my husband and kids. About a mile into the tunnel, I had a sickening realization: all my fuel had fallen out of my pocket. It hit me… I was going to have to use the fuel they provide at the aid stations on the course. And not all fuels agree with my GI tract. UGH. An hour and a half into the race I realized I needed fuel asap. At the next aid station I looked over the fuels (water and fuels were “self serve”) and grabbed a Roctane Blueberry Pomegranate gel. I downed the gel with a whole bunch of water (I carried 4 bottles with me on the course). I was surprised that I tolerated it well and didn’t have any tummy distress. I saw my family again at mile 21. Calves were cramping. I was hungry and tired, but I was still running, albeit slower than my goal pace. I passed a lot of people walking. It was hot and the water stations were too far apart. Sad glassy eyes. I threw up shortly after this picture was taken. As I ticked off the miles, and looked at my watch, I knew it was going to be tough to reach my goal time. The finish line was ahead, and I sprinted as fast as my cramping tired legs would let me… and I crossed the line in 3:45:01.6. I missed my goal by 1.6 seconds. It was 86 degrees by this time. I was cramping, dizzy, dazed, and clearly overheated. Then I vomited in front of my kids. A low point that day. I think I was home 24 hours when my husband planted the seed: I should run another marathon soon, since I’m already fully trained. We researched possibilities… and I decided to run the exact same race, only in September (they call it Tunnel Lite, since there are fewer runners). It was challenging to both recover from the last race and simultaneously prep for the next. When I told her how many gels (6) I had taken during the previous marathon, she asked how many calories I eat the day before a marathon. I wasn’t sure, but she told me I should be consuming “around 3000”. While I have focused on carb loading, I have never tried to come close to 3000 calories the day before a race. 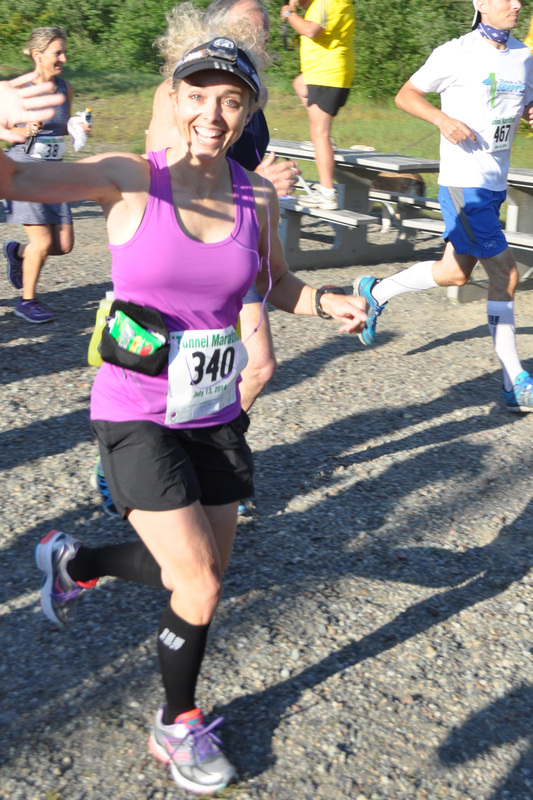 She told me if I was worrying about missing time in the first half of the race, I could intersperse several 1 minute intervals of increasing speed to almost a minute faster than my average marathon pace. I completed a 20 mile and 18 mile run before my next race, in between two 9 day family motorhome vacations, one of them to the Grand Canyon. It was tough to get my workouts in! September rolled around, it was time to run the same exact race I had run in July. I was ready to achieve my goal. The week before, I again ate conservatively. The day before the race, I pushed the calories to almost 3000 by snacking like crazy. The night before the race, I again took Imodium, but skipped the Prilosec this time. Brrr, 38 degrees at the start! 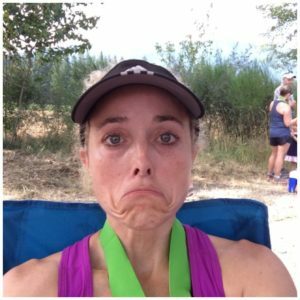 On race morning, I took another dose of Imodium and ate my simple breakfast of dry Life cereal. As we drove to the starting line, I watched the outdoor temperature (on my car’s thermometer) dropping. By the time we got to the start it was a very chilly 38 degrees… a far cry from the 63 degree start just 8 weeks earlier. I waited in line for the warm indoor bathrooms, and ate my UCAN. Finally, it was time to start the race! It was chilly outside, but it warmed up a bit once we got inside the tunnel. 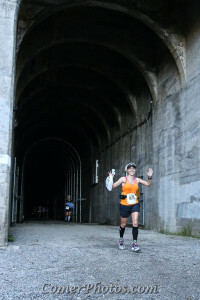 I wasn’t sure of my actual pace because I lost GPS signal inside the tunnel. Once we left the tunnel, I noticed the mile marker chalk lines weren’t on the ground like they had been at the previous race. So my pace at that point was a bit of a mystery. 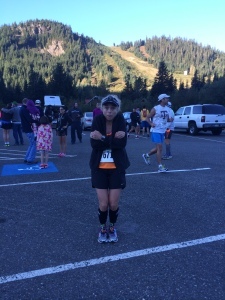 At mile 5 I admitted to myself that I had to pee badly (a side effect I have noticed with taking Imodium, I suspect it takes water out of the bowel and transfers to the bladder… though I have not confirmed the science on this). Maybe I can hold it for the rest of the race? I thought. However, I have learned from past experience that a full bladder will eventually lead to GI distress, which would be worse. I was trying to stay hydrated, but couldn’t drink anything because it made the bladder situation worse. By mile 11, I knew I would have to stop and pee. There were runners waaaay in front of me, and no one I could see behind me (we were running on an old railroad trail out in the woods), so I jumped off the path and pee’d in the bushes. It only took 17 seconds! I knew from previous experience I had no extra time to spare. So I used the trick taught by my coach: over the next several miles I sped up to ~45 seconds faster than goal pace for 1 minute, then slow back down to race pace. I did this several times, especially in the downhill portions. I saw the first mile marker at Mile 14 and realized I was at least 4 minutes slower than I needed to be to meet my goal time. I sped up just a bit, concerned that I would bonk before the finish if I went too fast. I was alternating Sport Beans and water with my favorite oral rehydration solution packets. He told me I was running strong and to keep up the good work. 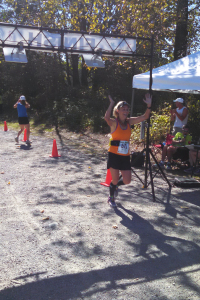 I realized at this point, I did not have the nausea that had plagued me with all three of my previous marathons. I think it was because I had run the first half of the race so conservatively. I significantly picked up the pace. The air temperature was rising, but I noticed my heart rate was staying around 164, a good place for me. 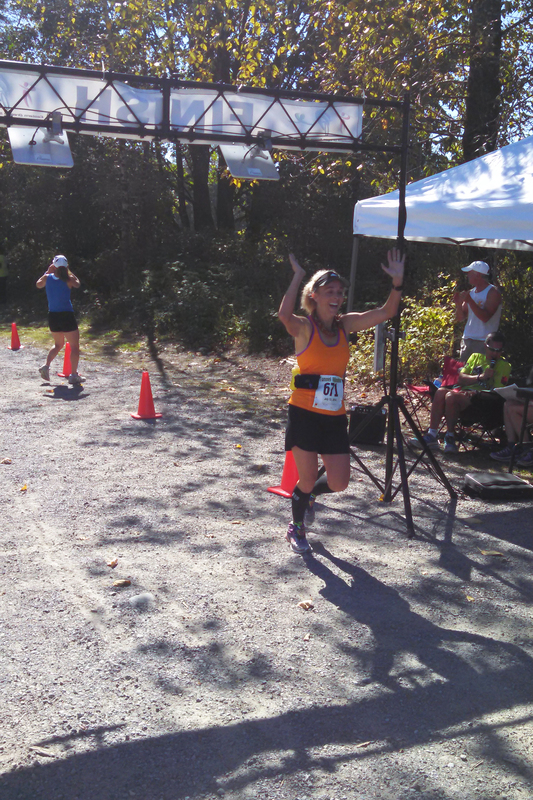 At Mile 21, my family cheered me on and my friend Eileen jumped in to pace me to the finish. The final 10K I ran over a minute per mile faster than my goal pace. I was tired but energized at the same time. My gut was quiet, so I took a shot of caffeinated gel and chugged down some water with three miles to go. We pushed hard the final miles, passing people who had passed me much earlier in the race. My calves started cramping just slightly at Mile 25, but it was much more manageable than it had been during my previous marathons. 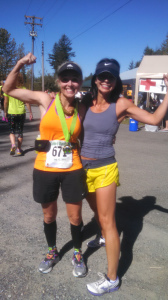 My friend Eileen was SO encouraging, keeping me on pace, and supporting me all the way. I ran the second half of the race six minutes faster than the first half. This is the first time I’ve ever run a negative split. I think it made a huge difference in how I felt the second half. No nausea or major calf cramping. Eating close to 3000 calories the day before the race allowed me to fuel less often during the race. Although it was still 76 degrees at the finish, my heart rate was much lower during the September race because of the cooler temps. Know where the aid stations are on the course and what fuel they offer at each. I didn’t pay attention before my July race because I thought I would be carrying all my fuel and water. But when I lost my fuel 1 mile into the race and needed to refill my water bottles on the course, I didn’t know where the aid stations were. Most importantly, Positive Thoughts and Never Give Up on Your Dreams! The day after the race, I applied for the Boston Marathon 2015. Ten days later I received my confirmation letter. Boston Marathon 2015 here I come!